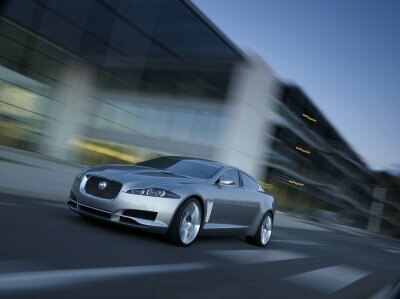 Well, almost... it's coming to a showroom near you in the spring of 2008 as a 2009 model but Jaguar just unveiled it's all new XF saloon which will premiere at the upcoming Frankfurt International Auto show. And this is really an all new car... it's not a makeover of an existing model, it's not a redesign, it is truly an all new Jaguar which hopefully will give the brand a shot in the arm and regain the ground it lost over the past few years. Jaguar gave us a good idea of the things to come when it unveiled the C-XF concept earlier this year and it became clear that Jaguar designers had been given the all clear to design an attractive and exciting all new saloon to replace the nice but not so exciting S-type. Jaguar Design Director Ian Callum calls the XF "a personal journey" for him, and "a career goal to return Jaguar to its rightful place as leader in automotive design". 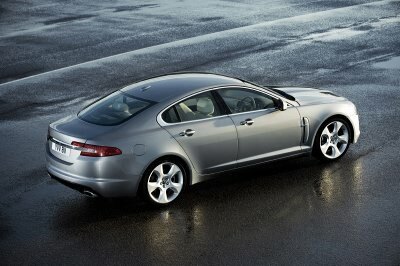 Like the concept, the new XF is sporty and muscular; it looks like it's ready to pounce on it's prey like a good Jaguar! Despite its aggressive look, the XF styling remains clean and fresh, without resorting to crease and clashing lines like so often seen on the competition... Despite having coupe like lines the interior space is impressive and offering a spacious cabin to its five passengers and a 17.6 cu.ft. of boot space; to increase flexibility the rear seats can fold down as well. Compared to its direct competitors (Audi A6, Mercedes E Class and BMW 5 series) the XF is slightly longer and wider. In the US, the XF will be available with either a 4.2 liter normally aspirated V8 (300hp/310lb/ft) or its 420hp / 408 lbft supercharged sibling; both engines are well know and proven in the XJ, XK and S-type. 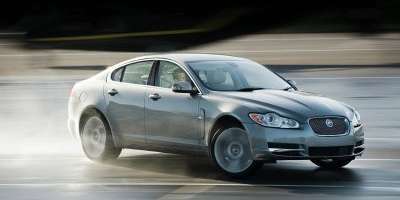 Like current Jaguars the transmission will be the automatic ZF 6 speed with adaptive gear changing although the XF will be the first car to feature Jaguar's new JaguarDrive Selector which will provide full control of the transmission standard or sport shifting modes as well as manual shifting with sequential paddle shifters. In European markets the XF will be available with a 240hp 3.0 litre V6 as well as a sophisticated twin turboed V6 Diesel which offers more torque than the normally aspirated V8 engine. Like the XJ and XK, the XF uses the latest technology yet without invading the driver with over the top and distracting systems. Jaguar electronic push button parking brake, extensive air bag system, Adaptive Cruise Control, two stage Dynamic Stability Control and a new Understeer Control Logic. Jaguar engineers spent a lot of time refining the XF shape in the wind tunnel adjusting the roof line and boot shape to optimize its stability and efficiency resulting in a drag coefficient of only 0.29. Performance will be similar to the current Jaguars with 0-60 times of 6.2 seconds for the normally aspirated version and 5.1 for the "R" version. European models will reach 60mph in very honorable 7.7 seconds with the diesel engine and 7.9 for the petrol V6. Brakes and suspension are identical on all "non R" models, with 17 or 18" wheels, 326mmx20mm discs and unequal length wishbone front / multi link rear. The R model will have 20" wheels, Jaguar's Computer Adaptive Technology Suspension with electronically controlled dampers and 355mm front discs to keep the extra power under control . Detailed interior specs have not been announced yet but you can expect the new cat to sport a luxuriously crafted interior featuring more real wood than in any Jaguar since the the Mark II including Satin American Walnut, Burr Walnut and a very modern, straight-grained Rich Oak, all blended with aluminum trim giving a modern touch. Prices for the new XF will announced in November and expected to be in the same range as the current S-type it will replace. While no announcement has been made, 2008 is expected to be the final year for the S-Type which was Jaguar's first medium sized saloon in 30 years when launched in 1999. And don't be surprised if Jaguar pulls the plug on the moribund X-type as well, focusing entirely on the triple X lineup : XF, XJ and XK.